Elise R. Irwin is assistant unit leader for the U.S. Geological Survey Biological Resources Division, Alabama Cooperative Fish and Wildlife Research Unit, 331 Funchess Hall, Auburn University, AL 36849. Frank J. Rahel is a professor at the Department of Zoology and Physiology, University of Wyoming. Donna L. Parrish is a unit leader for the U.S. Geological Survey’s Biological Resources Division at the Vermont Cooperative Fish and Wildlife Research Unit, School of Natural Resources, University of Vermont. David H. Wahl is an associate professor at the Kaskaskia Biological Station Center for Aquatic Ecology, Illinois Natural History Survey, and Department of Natural Resources and Environmental Sciences, University of Illinois. Recognizing excellence through awards to the membership is an important function of the American Fisheries Society (AFS). AFS awards are prestigious and often beneficial for professional advancement. Student members comprise approximately 15% of the Society’s membership, and they are very active. Indeed, the Society has identified recruitment and encouragement of students as important strategies of the organization (Johnson et al. 1994). One method of encouragement is through student awards. Awards are available to students from a variety of sources within AFS; however, because Society units are governed independently, the full extent, type, and range of these awards are not always known to students and their advisors. In addition to those honors, travel funds are sometimes available to increase student participation at meetings. To compile a resource list of these important benefits for student members, the Education Section surveyed AFS units to determine what student awards and travel funds are available. The initial survey was mailed to all Division, Section, and Chapter presidents (N = 78) in July 1996. We sent a second mailing to nonrespondents in January 1997. We also attempted to call nonrespondents on the phone in August 1997. Questions requested information relative to Best Student Paper awards, travel grants, and any other awards (e.g., scholarships). We requested data regarding how awards were financed, advertised, and decided, and then asked respondents how they ranked factors used in determining the awards and whether students were aware of these factors before competing. Data were compiled separately for Divisions, Sections, and Chapters. All four Divisions responded to the survey, and each offers Best Student Paper awards and travel awards, which are given to the student presenter of the best scientific paper at the respective annual or midyear meetings of each Division. Each Division also offers some type of travel funds to offset costs to attend meetings. Sixty-seven percent of Sections responded to the survey, and 43% of those offer or administer awards or grants. Sections offer or administer seven of the most prestigious AFS awards for students such as the Best Student Paper Award by the Education Section. Chapters represent the majority of units; 81% responded to the survey, and 86% of those offer a student award. Recognition of student excellence by Chapters varied widely, and units demonstrated creativity in developing awards. Of Chapters that offered awards, 76% had Best Student Paper awards, and 65% distributed travel grants. Scholarships were offered by 24% of Chapters, and 16% offered other types of awards. 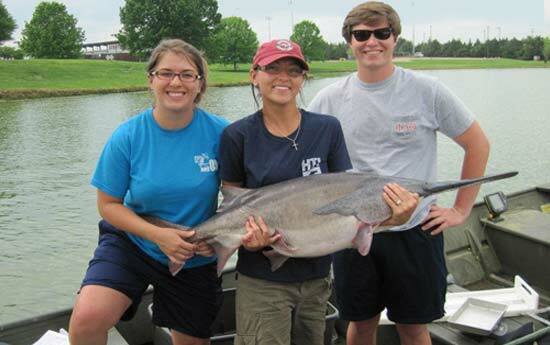 Examples of other types of awards included Outstanding Student Research Award (Idaho), Outstanding Fisheries Student Award (Tennessee), and Best Undergraduate Project Award (Missouri). Many respondents indicated that students were not excluded from competing for other awards (e.g., Meritorious Service) offered by their Chapters. Chapters that responded to the survey but either did not offer or were in the process of developing awards were Kentucky, Pennsylvania, South Carolina, West Virginia, and the University of Wyoming’s Student Chapter. For all units (Divisions, Sections, and Chapters), most awards were advertised in newsletters; however, some were advertised only via word of mouth. Awards were usually financed with unit general funds (awards may have been the motivation for fund-raising efforts). The exceptions were awards financed by endowment or donation funds (usually scholarships). Some units (n = 8) indicated they were in the process of developing awards. In addition, some respondents indicated that the survey would prompt procedural changes (e.g., providing ranking factors). We cannot conclude that nonrespondents do not offer awards. However, we have tried to include all current awards that could be identified and believe the list is relatively complete. For example, we included an award administered by a Section that did not respond because it is one of the most prestigious awards the AFS offers (J. Frances Allen Scholarship). This survey provided data indicating that AFS is rewarding excellence and increasing participation by the student membership with a great deal of commitment and creativity. We found a diversity of awards and other avenues to promote professionalism, and we encourage units to continue developing these. Because of the importance of student involvement in a successful future of the AFS, we suggest units use results of this survey as a challenge to develop new and innovative ways to recognize students. In addition, in spite of the diversity of awards, we believe it is important that these honors be advertised adequately to increase availability. Although newsletters are a primary communication tool, many units administer World Wide Web sites, and some (e.g., North Central Division) have published awards information on their Internet sites. We recommend awards and grants be advertised on web pages with ranking criteria, deadlines, and other pertinent information. Unit links are provided on the AFS site at http://fisheries.org. In addition, students should be made aware of other (nonstudent) awards offered by units and should be considered for those where appropriate. Any member can contact a current unit president (see AFS Membership Directory and Handbook) for information regarding awards, but students must realize the availability of awards because new ones are often being developed or may already be available. For example, since our initial survey two new awards administered by Technical Committees of the Southern Division (Reservoir Committee, two scholarships a year, and Warmwater Streams Committee, Outstanding Student Research Award) have been created. Also, the AFS Public Visibility Committee has launched a new student writing competition. Likely because of the independent development of awards by units, ranking criteria were often not known. We recommend establishing selection and/or ranking criteria and publicizing those criteria to students competing for an award. We also recommend including awards, selection/ranking criteria, and any associated forms in unit procedural guides and/or bylaws. Two other recommendations are that (1) judging student competitions can be difficult and should be made as objective as possible for judges, and (2) we recommend units publish the availability of new AFS awards developed since this survey was conducted. Finally, because professionalism equals volunteerism in AFS, we urge that efforts to reward excellence at all levels continue. Johnson, B. L., E. R. Irwin, M. L. Landolt, M. Loefflad, J. Marsh, T. R. Marshall, L. L. Olmstead, P. Pajak, S. Peterson, and J. Webster. 1994. The strategic plan of the American Fisheries Society. Fisheries 19(11):6-9.